So you've connected your iOS device to your computer, launched Enigma Recovery software and started a scan of your device, when the scan freezes or hangs in the middle of the scan. Check that you have the latest version of iTunes installed. Make sure that you have sufficient available space on your hard drive. Ensure that your device remains connected throughout the scan. It helps to make sure that you are using a genuine Apple cable to connect your device, as non-genuine cables can sometimes cause connectivity issues. Ensure that your device is recognised in iTunes - you can find out how to do this here. Try scanning different data types individually - this is especially useful if you only need to recover one or two data types, for example messages. Reducing the amount of data to be recovered can also reduce the scan duration. Try recovering your deleted data from another available iTunes or iCloud backup instead. 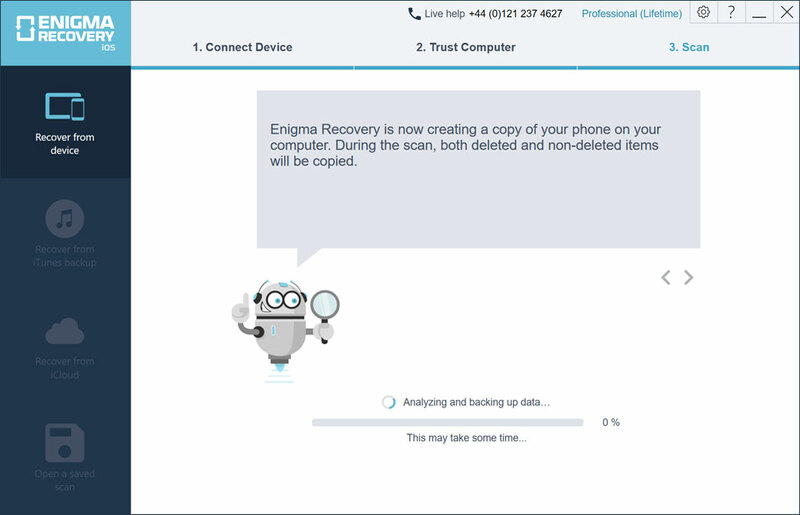 If you have tried the above and are still unable to complete a scan of your device using Enigma Recovery, email our support team at [email protected] or simply click on the Chat icon at the bottom of the page to start a chat with one of our support agents.